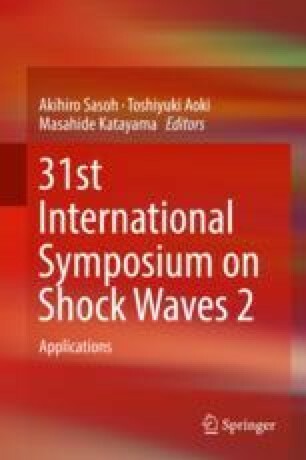 The motivation of this paper was to study the characteristics of start-up and the feature of shockwave under low Mach number in hypersonic inlet. The characteristics of flow field and shockwave at the critical starting Mach number (Ma3.8) without back pressure were numerically studied in the hypersonic inlet in which the design condition was Ma6. The results showed that the flow field and shockwave were unstable, and they were under some certain periodic oscillation state at the critical starting Mach number (Ma3.8). The total mass flow rate between inflow and outlet, the mass flow of throat, and the mass average Mach number of outlet all also showed periodic oscillation. Unmatched mass flow that passed through the throat that could not all pass through the exit of isolator was the induced reason of periodic oscillation. The block of the max mass flux flow through the area of throat was the main factor that caused the periodic oscillation of flow field and shockwave. The unmatched mass flux in internal channel leads to periodic “split out” and “swallow in” of “separation bubble” from the internal channel, which formed the periodic oscillation of flow field and shockwave. This work was supported by Grant No. 51606212 of the National Natural Science Foundation of China.